When my SIBO was in full swing, I really struggled with blood sugar control. At one point, my doctor suspected that I may have type 1 diabetes because my blood sugar was swinging so high following meals. But, my fasting blood sugar remained in the optimal range. When your blood sugar is swinging back and forth, you and your gut will feel terrible! I always felt completely wiped out right after eating. My energy levels were completely unstable throughout the day. I was also unusually hungry even right after eating a meal. I couldn’t go long periods without eating or I would start feeling dizzy, shaky and cold. All the classic low blood sugar symptoms. During this period, my gut symptoms were at an all time high. Nothing moved through my system efficiently. I had no bowel sounds and constipation was the norm. It felt like my gut had died. RIP Amy’s gut. I eventually was able to connect these symptoms to my blood sugar swings. I started to track my blood sugar following meals. Measuring my blood sugar allowed me to figure out the right foods, in the right amounts to better regulate my blood sugars. But, no matter how hard I tried to adjust my diet, I still couldn’t totally reign in my blood sugar. That is until I did my second round of antibiotics. I was still having lots of SIBO symptoms, so I jumped on another round of antibiotics (Rifaximin/Neomycin combo) and my blood glucose normalized. I was shocked by this at the time, but through my research I have a better understanding of why the antibiotics had such a drastic effect on my blood glucose levels. Blood Sugar Instability and SIBO: What comes first? The connection between gut imbalances and blood sugar instability is not linear. It is another chicken or egg scenario. SIBO and even large intestine imbalances can drive metabolic endotoxemia that can raise blood glucose levels. Metabolic endotoxemia is essentially an innate immune response that becomes a sub-clinical, persistent, low- grade inflammation because of increased circulating endotoxins, primarily lipopolysaccharides. LPS are endotoxins that are components of gram negative bacteria’s cell walls. An overgrowth of gram negative bacteria will produce larger amounts of LPS which will kick off your immune system leading to chronic low grade inflammation. This inflammation can lead to blood sugar instability and insulin resistance. If you have an active case of SIBO, you will have intestinal permeability and higher amounts of LPS entering your blood stream leading to metabolic endotoxemia. The antibiotics that I took cleared my SIBO lowering the amount of endotoxin producing bacteria leading to better blood glucose control. Now that you have a better understanding of how the gut can influence blood sugar levels, we can dive a little bit deeper into how high blood sugar can cause gut issues and SIBO. When blood sugar is too high, it damages the nerves in the gut. The enteric nervous system is responsible for blood flow, motility and enzyme release in the gut. You need these nerves to be healthy for optimal digestion. I have discussed in many past posts about how brain-gut axis issues are often at the root of many SIBO cases. High blood sugar levels will damage this axis preventing efficient communication between in the brain and the gut. It is not surprising that there is a well established link between diabetes and GI dysfunction. But, there are plenty of people without diabetes that have problems with blood sugar stability. In our modern world, the chronic stress from 60 hour a week jobs, sleepless nights, lack of activity/sunlight and poor diets can lead to chronically elevated cortisol levels. Cortisol raises blood sugar levels. Individuals with hypothalamus pituitary adrenal (HPA) axis dysfunction and cortisol dysregulation will have blood sugar swings. It is no surprise that high cortisol has been shown to decrease blood flow to the gut, MMC function, enzyme release and to increase intestinal permeability. In part, this decrease in gut function has to do with the activation of sympathetic nervous system (fight or fight response) and the shutting down of the parasympathetic nervous system (rest and digest response). But, these high blood sugar levels also could be damaging the enteric nervous system, which will further impair gut function. Thyroid dysfunction can also cause blood sugar instability. Low thyroid levels will reduce your cells sensitivity to glucose. This decrease in sensitivity has to do slower rate of: glucose uptake by the cells, glucose absorption in the gut, insulin response to high blood sugar and clearance of insulin from the blood. You may be eating a healthy amount of carbs, but because your cells are not as sensitive to glucose, your cells are deprived of glucose. This triggers cortisol release which as I mentioned above will raise blood sugar levels even further. This decrease in efficient glucose management usually leads to higher post meal glucose levels. Your body tries to compensate by producing and secreting more insulin. This compensation often backfires causing reactive hypoglycemia (low blood sugar). Many hypothyroid patients oscillate between high and low blood sugar, which results in a very unhappy gut. Polycystic ovarian syndrome is another hormone related condition that can also cause insulin resistance and blood sugar dysregulation. It is no surprise that there is a higher prevalence of IBS in patients with PCOS compared with controls. Diet can also be a huge factor in blood sugar control. Eating a diet high in processed carbs and inflammatory fats from refined seed oils can lead to inflammation and insulin resistance. Many Americans start their day off with a bowl of cereal, some juice and a banana. This traditional breakfast lacks balance with too many carbs and not enough healthy fat and protein. Carb heavy breakfasts can send your blood sugar on a rollercoaster ride for the whole day. Lack of adequate fiber in the diet can also cause higher blood sugar levels following meals. Refined seed oils found primarily in processed foods like canola oil, sunflower seed oil and soybean oil can also promote inflammation in the body that can drive blood glucose dysregulation. It can be really hard to manage blood sugars if you are eating a diet high in inflammatory fats. It isn’t just macros that make a difference in blood glucose levels. Making sure that you are eating a nutrient dense diet to make sure that you are getting adequate levels of nutrients that play a role in blood glucose regulation like Magnesium, Chromium, Zinc and B1. Many SIBO patients may have poor blood glucose control because they have limited/restricted their diet for too long, which can lead to deficiencies in these nutrients that are crucial for blood glucose control. As I mentioned above, SIBO and dysbiosis can cause metabolic endotoxemia and blood sugar instability. Clearing the SIBO, addressing pathogens and restoring balance in the large intestines will help stabilize blood sugar levels. Using a glucometer to track how your blood sugar is responding to meals can help you mange your blood sugar levels. You can gain an understanding about which foods and in what amounts cause your blood sugars to react. You may also notice that you tolerate more carbs at different points in the day. You want to shoot for fasting levels in the low to mid 80s and ideally blood sugar levels should return to below 120 two hours after a meal. I wouldn’t recommend tracking every single day, because it can be annoying to have to prick your finger all the time. But, checking in a couple days every month to monitor changes can be helpful. Glucometers are easy to find online and you can also buy them at your pharmacy. It can be easy to overly restrict your diet when you have SIBO. Overly restrictive SIBO diets can create blood sugar issues in a couple of different ways. First, cutting out tons of foods can lead to nutrient deficiencies that can lead to poor blood sugar control. For instance, thiamine (B1) is found in eggs, grains and legumes, which are often removed in SIBO diets. Lower thiamine levels can impair insulin synthesis and secretion leading to higher blood sugar levels. Magnesium and chromium are also critical minerals for blood sugar control that can become depleted if the diet is too restrictive. Second, cutting fermentable fibers in the diet can reduce levels of good bacteria that are essential for maintaining the intestinal barriers and reducing inflammation in the GI tract. These bugs are needed to prevent leaky gut that causes intestinal permeability. 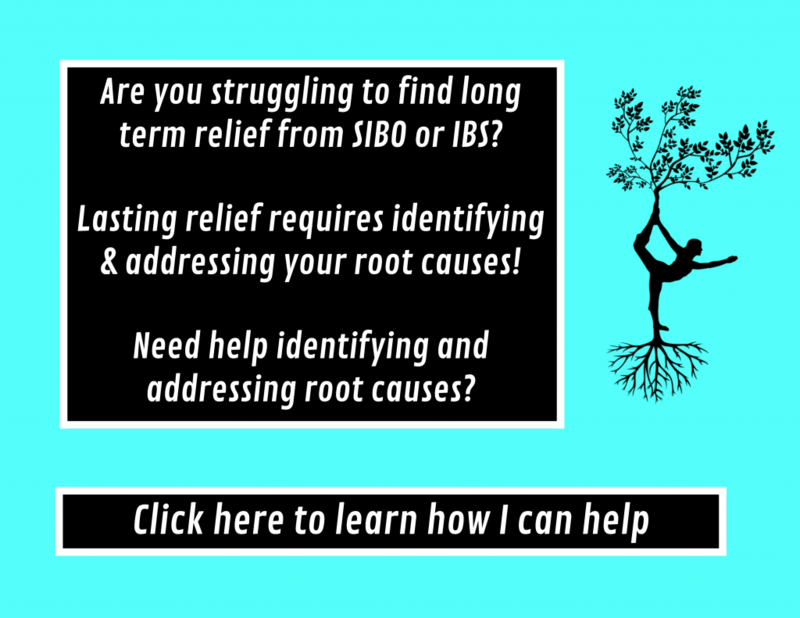 SIBO cannot be starved and by attempting to do so you could be creating more problems further downstream. Carbohydrates are not your enemy even if you are having blood sugar imbalances. Some people may do better cutting down on carbs, while others may need to add more in. Cutting too many carbs out of your diet can make blood sugar even more unstable. When you are not eating enough dietary carbs, your body releases cortisol to produce blood sugar by breaking down proteins into glucose. As I mentioned above, high cortisol levels will elevate blood sugars and totally disrupts gut function. Eating enough carbs can prevent this rise in cortisol. Carbs also support thyroid hormone activation. Too few carbs will suppress thyroid function leading to blood sugar problems. In certain cases, like insulin resistant PCOS, pre-diabetes or diabetes, lower carb might be a good option. But for many cases, low carb can backfire and lead to hormone dysfunction, gut problems and poor glycemic control. Sometimes just adjusting the composition of your meals can make a huge difference in your blood sugar control. Eating a meal with adequate protein, fat and carbs can help keep your blood sugar stable. Traditionally, the modern American diet tends to be super high in nutrient poor refined carbohydrates and inflammatory fats while being low in healthy fats and protein. When I coach clients, I always encourage them to plan their meals using the Rule of Thirds to help them construct more balanced nutritious meals. One third of your plate should be a protein, one third of your plate should be a non-starchy carb and the final third should be a fruit/starchy vegetable/grain (if tolerated). Just a balancing your plate can make a big difference! It is easy to get stuck in a state of chronic stress activation. To combat the unavoidable stressors of everyday life, it is imperative to employ stress management techniques into your daily routine. I personally love meditation and reading for stress management! Staying active is a great way to help with blood glucose levels. You don’t need to have an intense exercise routine to get the blood sugar benefits. A simple 20 minute walk following meals has been shown to lower post meal spikes in blood sugar. Strength training can also be an effective way to increase insulin sensitivity. Dr. Morstein recommends the Host Defense brand and to take 1 pill 2x daily. Gargling, gagging, singing and humming can activate your parasympathetic nervous system via your vagus nerve. When you are in a parasympathetic state, you are in a relaxed state versus being stuck in sympathetic “fight or flight” state. This relaxed state can help lower cortisol and also optimize digestion, both of which can better blood sugar control. These exercises can also strengthen and repair damaged nerve function in the gut that can result from high blood sugar and cortisol dysregulation. Circadian rhythms and getting adequate sleep at night are crucial for blood glucose control. It is important to try and get some sun exposure during the day and avoid screens before bed time. To learn more about circadian rhythms, check out this great article by Hack Your Gut. You can’t beat SIBO with your blood sugar swinging all over the place. Addressing blood sugar instability is a critical part in treating SIBO and preventing relapse. Need a little extra help figuring out how to stabilize your blood sugar? Work with me one-on-one to help optimize your blood sugar levels! Contact me to set up a free 20 minute consult to see if we make a good fit!